Lyme Rd, Uplyme, Lyme Regis, DT7 3UY. 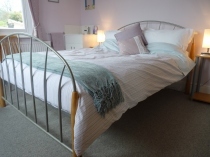 In the heart of the village of Uplyme, approximately 1 mile inland from the town we are on the hourly bus route which means you can have a carefree holiday and leave the car behind. Lyme Bay and the surrounding area forms part of the Jurassic Coast World Heritage site. We are about 5 minutes drive from River Cottage HQ. The nearest railway station is the market town of Axminster, which is only 4 miles from Lyme Regis.